Insanely faster cloud search results. Significant memory optimizations on search result parsing and display. Removed jDownloader libraries, less complexity, lighter app. Cloud audio downloads are much smaller, no audio demuxing necessary from video services. Cloud video DASH download support. Smarter playlist name suggestion algorithm takes into account ID3 tags. Fixes bug where new playlists wouldn’t be saved if default name was used. 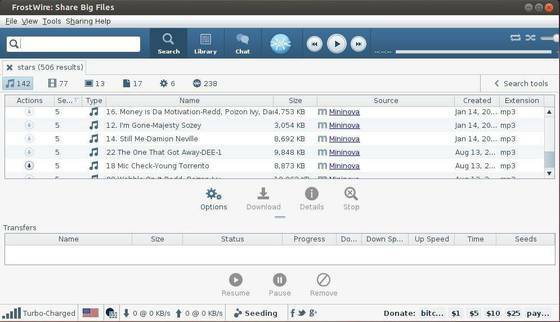 If you use Frostwire on Ubuntu Linux as your Bittorrent client, it’s strongly recommended to upgrade to this release. To do so, just go to the official webpage, download and install the the DEB package.